A fluffy green blanket cloaks its rolling hills. Brimming in shades of green, and once in twelve years in a bed of blue, this is Munnar- south India’s largest tea growing region. A popular south Indian hill station, Munnar is wrapped in a green cover all year round, which is lent to it by its dense tea plantations. It is, in fact, a commercial centre of some of the world’s highest tea-growing estates. At 1600 meters, Munnar is located at the meeting point of three mountain ranges- Kundala, Nallathanni, and Mudrapuzha in Kerala and very close to the border of Tamil Nadu, a geographical trait whose repercussions are evident in its culture. Narrow winding lanes get people here, who are rather safe in the hands of expert bus drivers, even if it might not seem so! Once there, rickshaws, autos, jeeps and cars are all at the disposal of tourists, with the drivers now semi trained as tour guides and coming in handy with a day’s sight-seeing packages and local information. A piece of information that no one needs to impart to you is that the place can be both sunny and soaked in rain in the same hour of the day. The hill station is known for notoriously pouring at any time, which indeed compliments its expansive tea produce all around. Just imagine the scents in the air that spread when raindrops kiss the tips of tea leaves…the dampness in the air filling the void of this sparsely populated region and how nature comes to fill hollow city hearts. 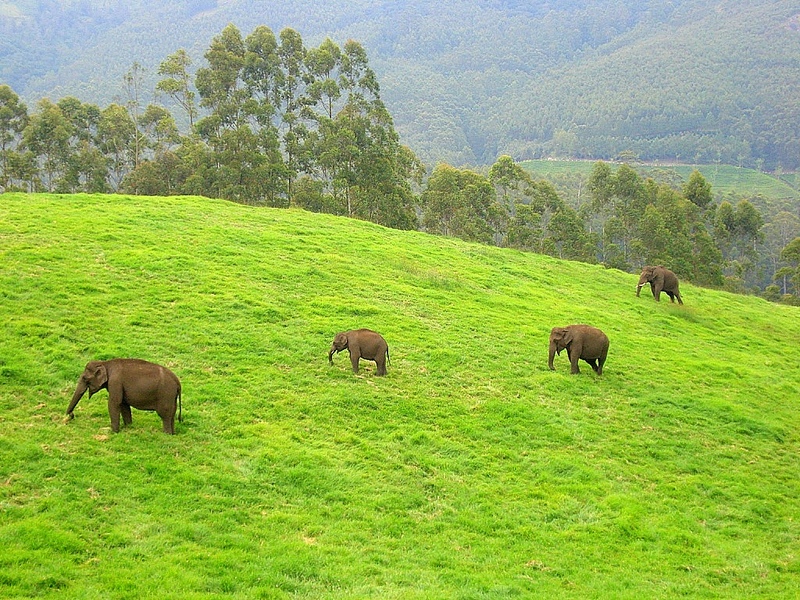 Taking walks in tea estates is synonymous to travelling to Munnar. Sipping freshly brewed cups of chai is a reward one can get after having experienced the process of tea plucking; but there are other tourist spots too, to visit and explore around. Your local driver should be able to lead you to these three popular tourist locations. Rest everything is in the vicinity too. Do look out for the big Malabar squirrels around here. 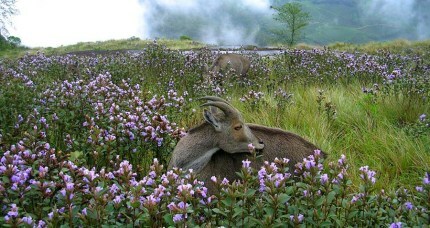 Popular for being the abode of the endangered mountain goat Nilgiri Tahr, the 97 sq. km. national park also houses several species of butterflies and birds. Tourists come here to trek all year round to the Anamudi Peak, the highest peak in South India, at a height of almost 2700 m. Treks to the peak are allowed with permission from the Forest and Wildlife authorities at Eravikulam. But the destination turns into a hotspot when the rare Neelakurinji blossom here, once in 12 years, making the landscape of the place go from green rug to a bed of blue. The flower that grows here is endemic to this part of the Western Ghats and makes tourists make a beeline for it, for its quite a spectacle seeing this face of nature. Talk tea and Munnar has a legacy to unfold. Titbits from history and evolution of tea estates, are all accounted for at the Tea Museum set up by Tata tea, a major tea grower in the region. There are artifacts, photographs and machineries, all of which have a story to tell about the origins and growth of tea plantations in Munnar. 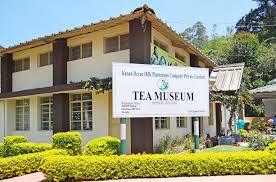 About 1.5km northwest of Munnar Town, the museum is a demo model of a working tea factory, but displaying only basic processes. A tea roller dating back to 1905 is also another catch for tourists here. Not too far from Munnar Town is Chinnakanal and its waterfalls, popularly known as the Power House Waterfalls, for they cascade down a steep rock 2000 m above sea level. 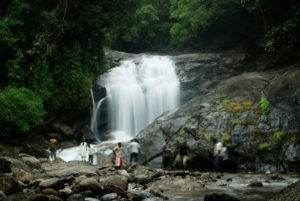 The spot is enriched with a scenic view of the Western Ghats. About seven kilometers from Chinnakanal and 22 kms from Munnar is Anayirangal, another dense tea estate, which border the Anayirangal dam, just another spot to find solitude in the peaceful environs of Munnar.